Click here to schedule your screening today! As you may know by now, Milwaukee County Jail and House of Correction recently announced its intention to award the Medical Health Care Management and Mental Health Care Management contract for the Milwaukee County Jail and House of Correction to CCS/CMGC, Wellpath. As President, I want you to know that we are interested in retaining all qualified and credentialed employees for appropriate positions within the contract staffing plan. We will also be scheduling employee screenings for any staff members interested in scheduling an eligibility meeting for continued employment. 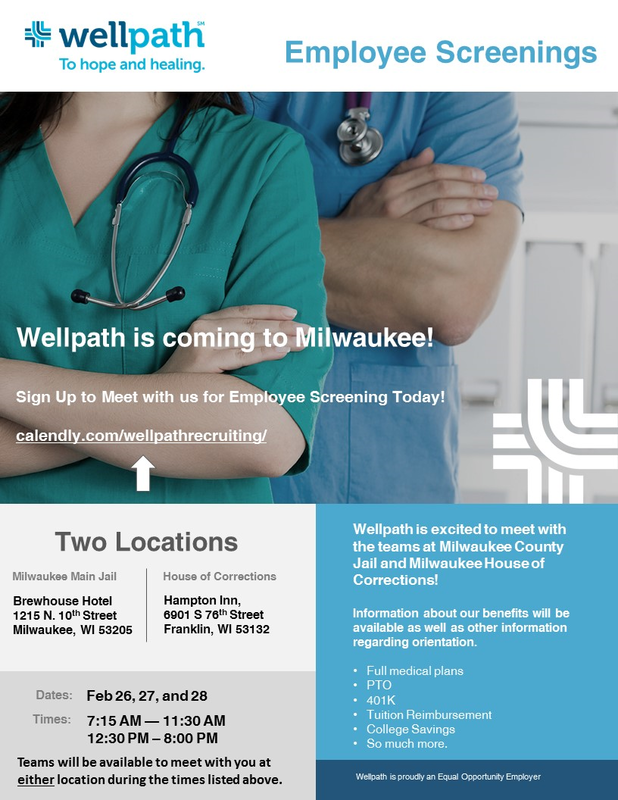 If any employee that is interested in employment with CCS/CMGC, Wellpath is not available on either of these dates other accommodations will be made on an individual basis or if you would like to go ahead and complete your profile, you can do so by clicking here. If you would like additional information, visit our Frequently Asked Questions page by clicking here. We will be back at Milwaukee County Jail and House of Correction on later in the month of February to conduct screening interviews. More information and sign-up sheets to follow. We look forward to establishing a partnership in correctional health care excellence by working closely with the command staff at the Milwaukee County Jail and House of Correction. We realize our most important assets are our people and we are excited about the potential for each of you to become part of the team.